Beautifully engraved SCARCE certificate from the Transcontinental Air Transport, Inc. issued in 1931. This historic document was printed by the American Banknote Company and has an ornate border around it with a vignette of a plane flying over a train. This item has the printed signatures of the Company’s Vice President and Secretary and is over 81 years old. 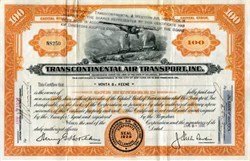 Distribution of Transcontinental & Western Air Stock in respect of the shares represented by this certificate has been made in accordance with the resolution of the Board of Directors adopted December 1934. 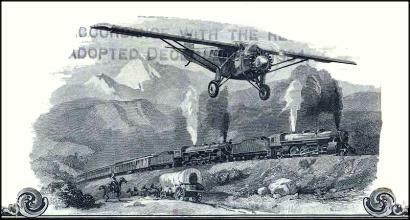 Transcontinental Air Transport was incorporated in 1928. The Transcontinental Air Transport-Maddux Air Lines (TAT) was formed from merger of Curtiss Aeroplane & Motor Co, National Air Transport, Pennsylvania Railroad, Wright Aero Corp, and St Louis businessmen. In 1929, the company merged with Western Air Express as Transcontinental & Western Air (TWA).